A new study has found that public sector workers don’t necessarily get paid more—they just get paid more fairly. When similar occupations are compared, wages in the public sector are not only similar to the private sector, but they are much more equitable, especially for women, racialized and Aboriginal workers. Narrowing the Gap, published by the Canadian Centre for Policy Alternatives (CCPA), uses the most detailed data available: annual wage information from 2.5 million Canadians with 520 different specific occupations identified in the 2011 National Household Survey (NHS). Study authors Kate McInturff and Paul Tulloch build on CUPE’s Battle of the Wages study, comparing the wages of full-time public and private sector workers, and including information on Aboriginal and racialized worker status, along with educational level. It finds that significant gaps persist in all areas for a number of reasons but those gaps are bigger in the private sector in every instance. University-educated Aboriginal workers make 44 per cent less than their non-Aboriginal peers in the private sector. In the public sector, the wage gap is 14 per cent. University-educated women working in the private sector earn 27 per cent less than men in the private sector. The wage gap in the public sector is 18 per cent. University-educated racialized workers take home 20 per cent less than their peers in the private sector. 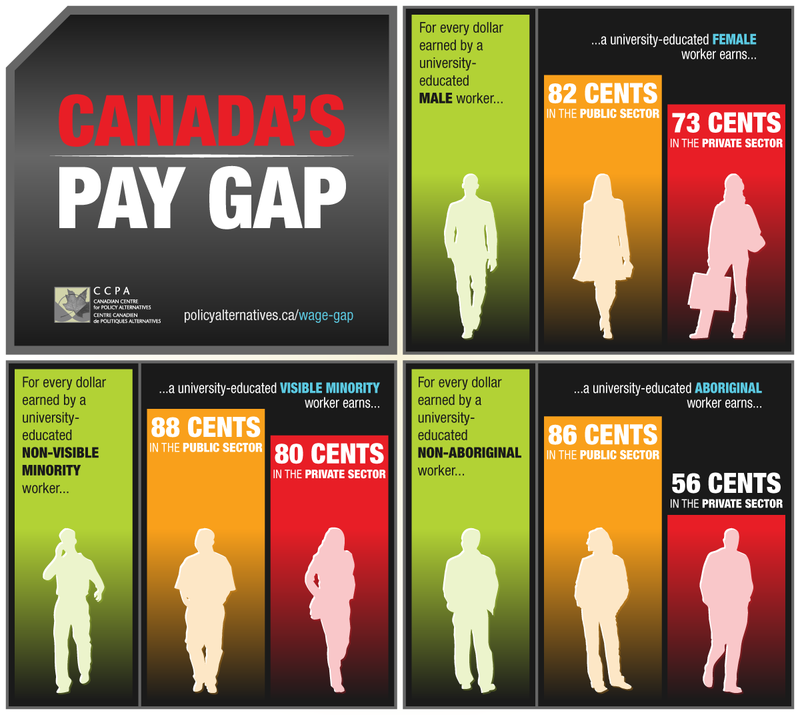 In the public sector, the wage gap is 12 per cent. According to McInturff, “Salaries are higher in the public sector precisely for those groups of people who experience the greatest discrimination in the private sector—because the public sector goes further in correcting those discriminatory practices. The result is not higher wages but rather a more equitable system of pay.” Higher rates of unionization, pay equity legislation, and better access to family benefits all help reduce wage discrimination in the public sector. On average, when similar occupations are compared in both sectors, full-time wages in the public sector were 2.3 per cent higher in 2010, the time period covered by the 2011 National Household Survey. The CCPA study uses wage levels for 2010 because that’s the latest year for detailed data available through the NHS and Census. Since then wage increases in the public sector have lagged considerably behind the private sector. Data on wage settlements compiled by Labour Canada show that public sector agreements have provided average increases of 5.9 per cent over four years since 2010, while private sector agreements have provided increases of 8.1 per cent over the same period. The 2.2 per cent gap suggests that the overall difference registered in 2010 has since been eliminated by slower wage growth in the public sector.